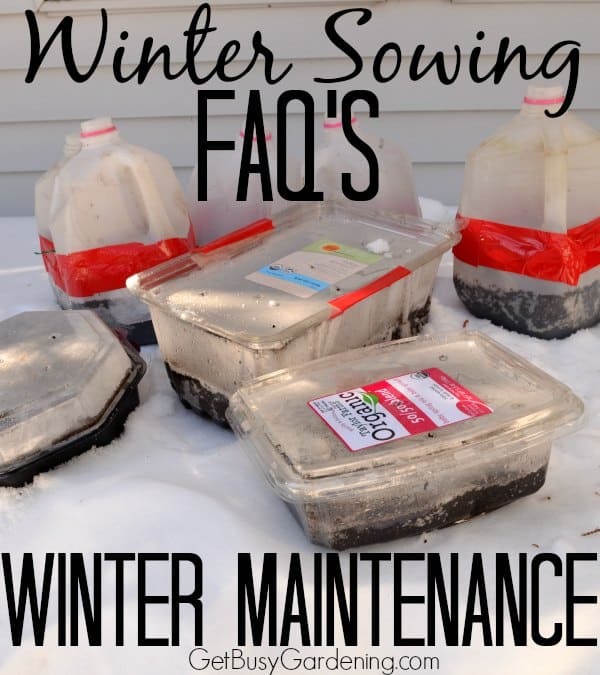 This is the second post is a series that I’m doing where I’m answering your FAQs (frequently asked questions) about winter sowing. Rather than write one huge post, I decided to break all of the FAQs down into categories. In the first post, I answered some winter sowing FAQs about getting started. In this post, I’ll answer FAQs about winter maintenance. If you’ve never heard of winter sowing, or want to learn how to winter sow seeds, start by reading this post… Winter Sowing – A Step By Step Guide. How many seeds should I put into each of the winter sowing containers? 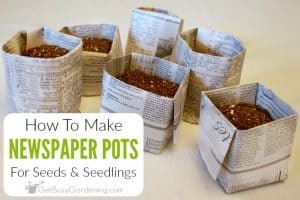 What should I do with the winter sowing containers if it snows? 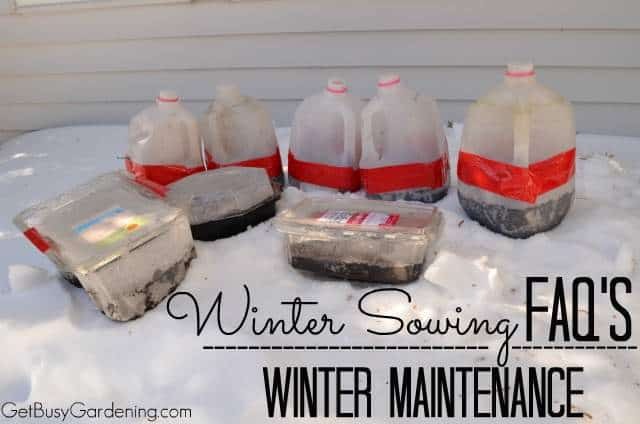 Should I be concerned about freezing and thawing of my winter sowing containers? Do I need to protect my winter sown containers from harsh cold if we don’t have any snow to insulate them? 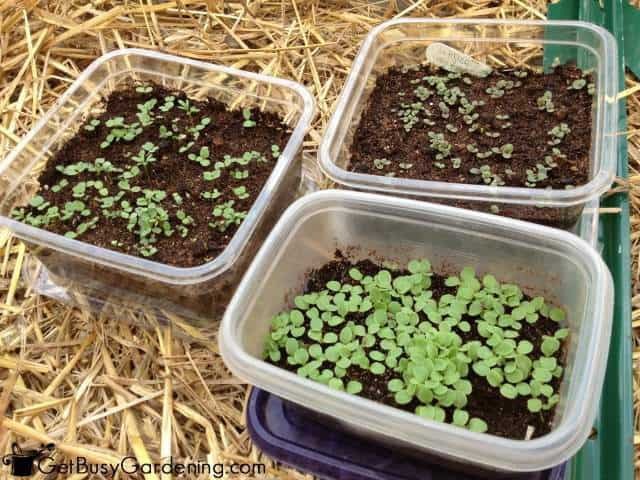 When can I expect to start seeing sprouts in my winter sown containers? How many seeds should I put of the winter sowing containers? 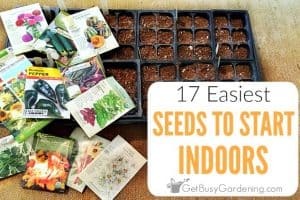 Answer: You don’t want the seeds in your winter sowing containers to be planted too close together, because that will make it more difficult to separate the seedlings. 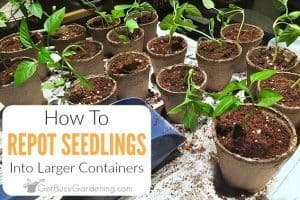 But you don’t have to get too worried about spacing since the seedlings won’t live in the winter sowing containers for too long. As a general rule, I usually try to space my seeds about an inch apart in my winter sowing containers. I give a little less space for smaller seeds, and I give the larger seeds a little more room. 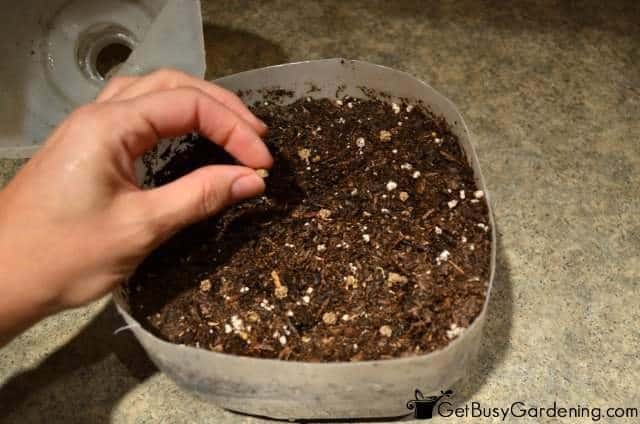 For tiny seeds, I just sprinkle them over the top of the dirt. Sometimes I squeeze the seeds in closer if I have a few left over. Answer: Nothing, let your winter sown containers get covered by snow. It’s nice because as the snow melts, it will seep into the containers, keeping them nice and moist. 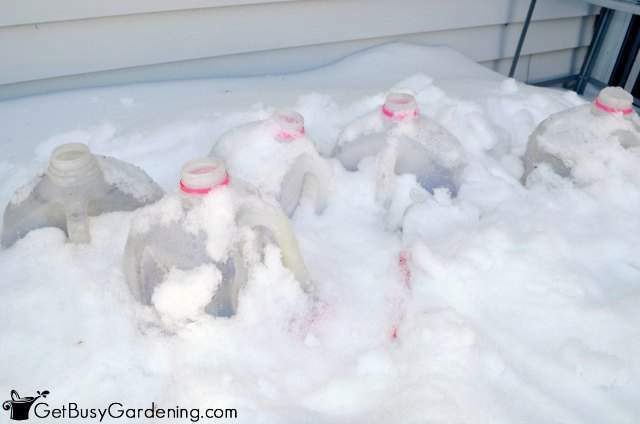 In the spring after the snow melts off my winter sown containers, I go out there once and a while and toss more snow on top – that makes it easy to water them. Answer: No. The seeds in your winter sown containers are going through the same treatment as the seeds that have sown themselves naturally in the ground. It sounds funny, but the seeds are programmed to know when it’s safe to start growing. So don’t worry about your winter sown seeds, let nature take its course. Answer: No, put your winter sowing containers out there in the freezing cold… and forget about them until spring. That’s the beauty of winter sowing! Answer: Once the weather starts to warm up a bit in the early spring, you’ll start to see sprouts in your winter sowing containers. On average, I will start to see sprouts in my winter sown containers in early March… but I’m in Minneapolis z4b. Warmer zones will start to see sprouts much earlier. The first time you see green in your winter sowing containers is very exciting! Do squirrels or raccoons bother your seedlings? Squirrels are big pests in our yard and once it's dark out, the raccoons are too. I'm in Mpls too! We have squirrels and raccoons too. I have never had a problem with these pests getting into my containers. If I were you, I would try putting out a few test containers now and see if they bother them. I will include more tips about this topic in my next Q&A blog post, thanks for the great question! I think I might try to winter sow on my back porch. I'll have to water the containers, but I'm thinking putting them on the porch will keep the critters out. I have rabbits, raccoons, and squirrels all over my yard and I'm afraid they'll get into the containers. Funny, you asked almost the same question as the person above (see my previous comment). I will post more tips about critters in my next Q&A post. I think this method would work fine in your porch if it's screened in. But, if it has windows, be careful because your containers may sprout prematurely (the greenhouse effect). Thanks for your comment. In a previous post on winter sowing, you mentioned limiting containers to morning sun at first. When do you think they should be moved to a more sunny location? Great blog, by the way! I put my jugs and containers in milk crates which prevents them from getting tipped over by critters and the high winds we have been having. It also makes it easier to move them from my deck in the Spring when the sun gets too intense and move them into an area where they won’t overheat.